When Windows Server 2016 ships, Microsoft will release WMF 5.1, which includes all the changes and responses to your feedback that have been made since WMF 5.0 shipped. Many of these improvements are currently included in the Windows 10 Insider Builds. Please take advantage of our UserVoice forums (https://windowsserver.uservoice.com/forums/301869-powershell) to tell the PowerShell team of issues you encounter in WMF 5.0, Windows 10 or Windows Server 2016 Technical Preview releases. Your input matters and the information in UserVoice will be used to identify and prioritize the most critical items to address in Windows Server 2016 and WMF 5.1. 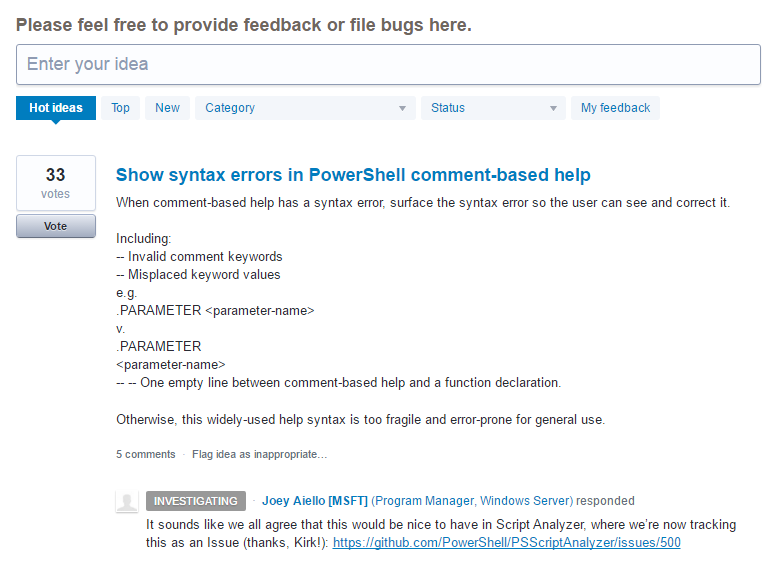 This entry was posted in PowerShell and tagged WMF; UserVoice. Bookmark the permalink.